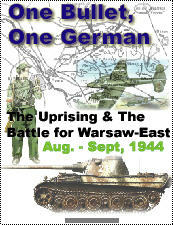 One Bullet, One German covers the Polish uprising in Warsaw and the military operations in the immediately environs east of the city in August, 1944. It was critical time for the German: not only was there the Warsaw Uprising to contend with, but a few miles east of the city, the German panzers were reeling back from a massive Red onslaught. The only up-side for the German was their keen ability to multi task with weakened forces. The Russians had their own set of problems. The onslaught had created directional problems as their armies approached the Vistula River. Because of this, their strength was divided. Many forces were ordered to seize bridgeheads across this key river south of Warsaw. Others were ordered to move along the Vistula north to Warsaw, still others, simply advance westward. The Russian forces were fast approaching the end of their supply chain after advancing hundreds of miles. Their tanks had also taken a toll from combat and breakdowns. All units had arrived in the area of Warsaw in a tired and weakened state. The main reason for the Polish uprising was to seize the bridges and portions of Praga, the east part of the city east of the Vistula. It was hoped that the Russian forces would meet them there and cleanse the area of Germans. 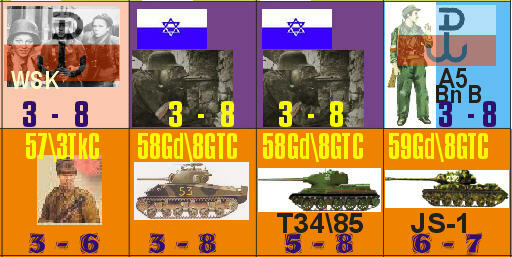 This is what the game covers: the Uprising and the last panzer victory a few miles east of the city where the 3rd Tank Corps’ was ripped apart by the withdrawing panzers! 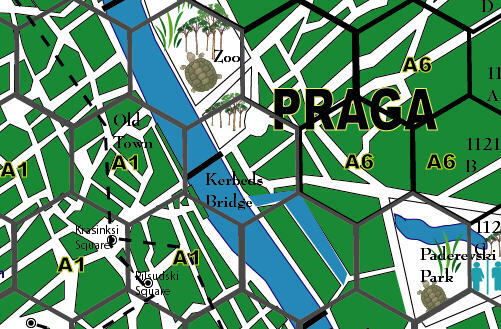 The map scale is about 400 yards per hex on the Warsaw map and 1 mile on the East of Warsaw map. Each combat unit is a battalion unless otherwise designated. A game turn represents 4 days of time. Each Polish resistance fighter unit is around 500 men. The game uses a modified system used in ATO's Into the Beartrap game. Two 11x17" maps, over 300 counters. Rules cover: Unit Activation, Random Events, Polish Ammo Limitations, Sewer Movement, Air Units, Close Assault, Divisional\Corps Integrity, Using "Karl", Barricades, Snipers, Rubble, Airdrops and more!